It’s starting to feel like no-one can hold on to the top spot in the VMSL Premier Division for too long this year. Croatia SC were the latest team to suffer the league leaders curse this past weekend, falling to third place in the standings as a result. CCB LFC United and West Van, meanwhile, both came away with huge wins, and those two teams now not only share first place, but will meet in what could prove to be a title decider at Surrey’s Newton Athletic on Friday night. 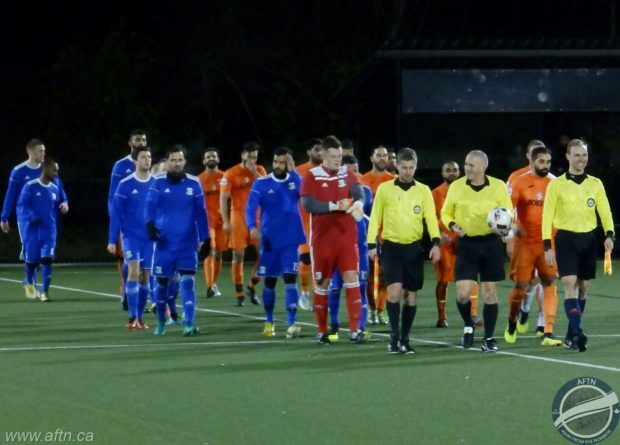 Croatia were hosting Coquitlam Metro Ford Wolves at Burnaby Lake on Friday night, and their evening got off to a bad start when Juan Sanchez put the visitors ahead just five minutes in. That was how it stayed until half time, but Metro Ford got off to an even faster start in the second half when Adam Jones put them two up seconds after the restart. Daniel Davidson pulled one back for Croatia on the hour mark, but Jones wrapped up the three points for Coquitlam in the 80th minute to hit Croatia’s title hopes hard. As Croatia faltered, CCB took full advantage with a very hard-fought 4-2 win over defending champs BCT Rovers Tigers United at Newton, in what was a cracking match between two of the best teams in the league this season. It was an end to end game from the outset, but it was Rovers Tigers who struck first when Nick Soolsma hit his 31st of the season, burying a penalty after a handball in the box four minutes in. Their lead was to last just five minutes, as CCB hit back with two goals in a two minute spell. First Nic Morello ran in on goal and slotted home and that was quickly followed by Yassin Essa, who blasted one high into the net from the edge of the box after a quick break up the left. The game continued back and forth at a fast pace, with both teams exchanging chances, but it was Rovers Tigers who finally struck next when Pavi Dhillon tucked one away into the bottom corner from just inside the box. The pace dipped a little at the start of the second half, but with CCB making most of the running a double from Milad Mehrabi was enough to secure the vital victory and send them to the top of the standings. Mehrabi grabbed his first in the 61st minute, bundling the ball home after a scramble in the box, before firing home from the edge of the box with 13 minutes of the match remaining, sparking wild celebrations on the CCB bench. 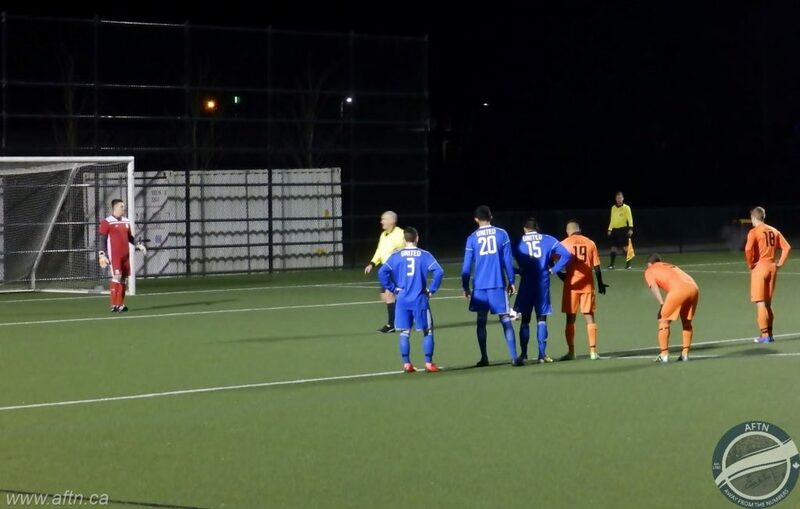 The win shot CCB into sole possession of first place, and two points clear of Croatia, but they were soon joined there the following day by West Van, who were once again made to work to secure their points in a 2-1 win over Club Inter EDC Burnaby. Inter went down to ten men just four minutes in when Jordan Michael was sent off for a handball, with Colin Phillips putting the Amblesiders ahead moments later. The ten men fought back and tied things up just before half time through Liam Miller. Phillips grabbed his, and West Van’s second, in the 65th minute, and that was enough to take all three points, while Inter finished the match with nine after their leading scorer Mohammed Habib was sent off in the dying moments. That moved West Van onto 41 points and a share of the lead with CCB. The two teams now meet in what should be an absolute cracker of a match, and a possible title decider, at Newton on Friday night with an 8.45pm kick off on the stadium turf. CCB do have a game in hand, so a defeat or draw will not be too detrimental to them, but you feel it’s almost a must win for the Amblesiders. CCB have three league games left after this one where they’ll be away to Croatia at Burnaby Lake, then finish their season with home games against Pegasus FC and Club Inter EDC Burnaby. 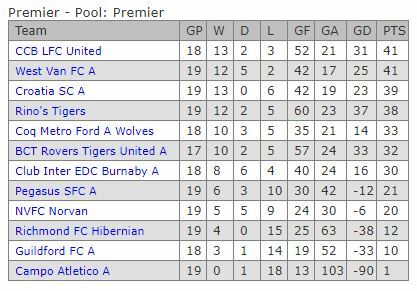 West Van will have two games left after this Friday, a home match against Rino’s Tigers, then away to NVFC Norvan. West Van’s final two opponents met in the last match of the weekend on Saturday afternoon, with goals from Chris Rushworth, Ahmed Alghamdi, and Pascal Schmidt giving Rino’s Tigers a 3-0 win over NVFC Norvan. Friday’s other two matches were 6-0 blowouts that could have a big impact in the battle to avoid the drop. Newton was the venue for the Surrey derby between Pegasus and Guildford, with the Horsemen running out comfortable 6-0 winners thanks to a Chetan Jhooty hat-trick and goals from Kerman Pannu, Race Williams, and Sahil Sandhu. Campo Atletico’s horrible season continued as they found themselves on the wrong end of a six goal trouncing at Richmond FC Hibernian. Liam Robinson grabbed a hat-trick, with Tim Sowerby, Trent Lebans, and William Siu getting the other goals. Another horrible outing for the Campo defence, but this was one that officially relegated the team back down to Division 1 for next season. Richmond now leapfrog Guildford into 10th place, and out of the relegation zone with three matches of their season remaining. Guildford do have a game in hand, and host Richmond in what could be a make or break match for both sides at Newton on Saturday evening (kick off is 6pm). With the Imperial Cup getting underway for some teams this weekend, and an exciting title run in to look forward too, it’s an exciting time for football in the lower mainland. You can find all of this week’s league and cup fixtures, plus results and standings across all seven divisions, on VMSLsoccer.com. And don’t forget to check out the Take The Piss forums for all your local football banter and Canucks4Ever’s weekly match previews and predictions.